There are a variety of types of pellet appliances used for heating with pellets, including pellet stoves and inserts. For more detailed information about pellet appliances, please read the Pellet Stove Fact Sheet. Thinking of purchasing a pellet stove or insert? 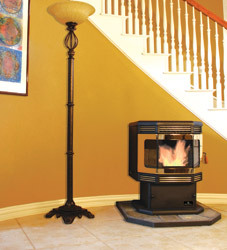 Learn more about the proper placement and maintenance of pellet stoves. What materials and products can be used to vent pellet stoves? Besides appliance requirements, what other factors may be considered in specifying pellet venting systems? How should pellet venting components be assembled and joined together? What’s a good starting point for learning to operate a pellet stove? How do I start a fire in a pellet stove? What if the stove doesn’t start properly? How do I shut down the stove? What safety controls are in place for unexpected shutdowns such as power outages or component failures? What are the routine things that I need to do to keep my stove working correctly? What are some of the more advanced maintenance tasks? How do I select a service technician? What will I like about heating with pellets? Venting. Maybe limited by factors like obstructions above for vertical venting through the ceiling and roof, or by the distance to an outside wall for horizontal venting. Outside air for combustion, if needed. Must be drawn from an approved location. Electrical requirements. Proximity to a properly wired outlet. The floor must be protected according to the pellet stove manufacturer’s instructions. The minimum size of the noncombustible floor protector is clearly specified in installation instructions. The choice of suitable material usually requires professional assistance, unless a suitable hearth is not already available in the home. Built-in appliances may require an additional layer of protection, such as an air space between the appliance and the floor protector. The dealer or installer should check the intended appliance outlet for proper voltage, ground, and polarity. The electrical circuit to be used should have a properly rated circuit breaker. •Are there special requirements for mobile home installations? The model you choose must be approved for use in a mobile home. The U.S. Department of Housing and Urban Development (HUD) makes additional requirements for solid fuel burning appliances installed in mobile homes which are listed in stove manufacturers’ installation instructions. The product specifically tested and listed for use with pellet stoves is PL vent pipe, labeled as tested to UL 641. PL vent pipe is double wall pipe; the stainless steel inner pipe that carries the exhaust products is separated from the outer wall by an air space. Pipe joints must be sealed gas tight to prevent exhaust products moving through the vent under pressure from leaking into the home. Stoves tested and listed with PL vent requirements cannot safely be vented with substitute materials. Pellet fireplace inserts and freestanding stoves are often vented into existing masonry and factory-built fireplace and woodstove chimneys (Figure 8). The chimney should be inspected before installation to ensure that it is clean, mechanically sound and meets local safety code requirements. The appliance manufacturer’s installation instructions may require relining the chimney with an approved metal liner, pipe or PL vent. Vents or grilles on the face of factory-built fireplaces which provide cooling air to the outside jacket of the fireplace must not be blocked. Cleanout access for future maintenance should be considered. Sidewall horizontal venting (Figure 9). Invariably the least expensive venting system. Disadvantage of potential smoke spilling into the house in the event of a power outage or component failure, or house depressurization (see discussion of next question). Horizontal vent with backup vertical venting (see Figure 10). Preferred horizontal method that avoids venting problems associated with unexpected appliance shutdown. Vertical venting through the ceiling and roof (Figure 11). Has the advantages of keeping vent gases warm and of providing natural draft to prevent problems in an unexpected shutdown. Venting into existing chimney (see Figure 8). Stove manufacturers provide recommendations for venting into masonry and factory-built chimneys, which may include partial or full chimney relining. Natural Draft: All vents for appliances designed without mechanical exhaust fans must meet stove manufacturer’s requirements for minimum draft and must terminate above the roof. Altitude: High altitude installations, generally higher than 2500 feet above sea level, may require special venting options to provide adequate combustion air and/or draft. House Pressure: Extremely tight house construction or strong kitchen, bath or other exhaust fans may create a negative pressure within the home that decreases venting effectiveness. May necessitate an approved outside air source. Windy Conditions: Unpredictable effects of high winds or prevailing wind conditions may necessitate the addition of vertical venting that extends above the roof and/or special termination caps. Cleanout and Maintenance: The venting system must be designed with normal maintenance in mind. Appliance manufacturer’s instructions should be followed closely regarding sealing joints and seams, particularly of pressurized mechanical exhaust vents. It is imperative that they be gas tight so that they cannot leak. Proper application of an approved sealant or sealing band is typically required. Appliance manufacturer’s instructions for pipe sealing which exceed vent manufacturer’s instructions must take precedence. You can get a sense of what heating with pellets involves through an introduction to the principles of operation and the reasons for maintenance that you will come to understand as an experienced operator. The rule here is “Before all else fails, read the instructions.” Operating a pellet stove is not difficult, but it is a new technology that calls for basic knowledge. Training videos accompany some stoves, and hands-on demonstrations are offered by many dealers and installers. Properly operated and maintained pellet stoves experience few, if any, problems. Most of pellet stove operation is automatic, but sometimes combustion air adjustment is needed. A lazy, orange, sooty flame or dark smoke coming out of the vent (after startup and before shutdown) may indicate the need for more air. An overactive, “blow torch” flame calls for less air. Performance problems are more likely to be caused by neglected maintenance than by regular operation. Lazy flame, dark smoke, unusual sooting of glass, unexplained smoke spillage and reduced heat output all point to the need for maintenance of appliance components and/or the venting system, or for remedies for house depressurization. Problems related to mechanical failure usually results in safety switches shutting the appliance down. Appliance shutdowns may, however, indicate nothing more than owner forgetfulness (empty hopper) or hurry (improper startup), or intermittent power failure. Unexplained, repeated appliance shutdowns call for professional advice and service. Shutting the stove down is typically a matter of simply setting the control to the “Off” position according to operating instructions. The fuel feed stops delivering fuel right away, and after the stove cools sufficiently, all motors and blowers cease operation. The stove should NOT be shut down by unplugging the power cord. Although fuel feed stops in a power outage, the pellets in the burn pot may continue to burn or smolder. The duration of this condition can vary with appliance design from a few minutes to an hour or more. The resulting smoke and hot gases rise, seeking the path of least resistance. If the exhaust vent does not have vertical sections to provide natural draft, smoke may spill into the home (Figure 14). Burn pot (Figure 15): Checked daily and cleaned periodically to keep air inlets open. Frequency of cleaning depends on fuel type, grade, and content. Ash drawer (see Figure 15): Emptying recommended before starting new fires and occasionally during stove operation. Frequency depends on fuel and stove design. Typically once or twice a week, but monthly in some new designs. Heat exchanger (Figure 16): On some stoves, simply a matter of moving a rod that scrapes the tubes inside the stove. May require professional service on others. Ash traps: Chambers located behind the fire chamber which prevent excess fly ash in the exhaust from exiting the stove. Easily accessed for ash removal by owners in some designs; on others, professional service is required. Hopper: Checked for accumulated sawdust materials (fines). Fuel in the hopper and auger tube should be emptied occasionally to prevent auger blockage by fines. Cleaning the venting system is usually performed by professionals (see below), but can be tackled by the handy stove owner with thorough knowledge and the right equipment. Motors and fans need occasional cleaning and may require lubrication. The wrong lubricant or wrong amount of lubricant can damage components. Some components which call for removal for service require the replacement of a gasket. Additionally, gaskets for the fire chamber door, ash pan door and hopper lid (on some designs) may need occasional replacement to assure a tight seal. Emptying ash traps and cleaning exhaust passages behind the fire chamber. Cleaning and lubricating fans and motors. Cleaning the hopper and fuel feed system. Cleaning the heat exchanger system. Cleaning exhaust pipes and resealing the venting system if needed. Verifying and adjusting the stove settings with proper gauges and meters. Mechanical and electric components may eventually wear out and need repair or replacement. Many manufacturers now offer low-cost, high-value extended warranties on electrical components. You can also benefit from professional advice that helps you improve stove performance and convenience with operating tips or fuel information. Finding competent in-home service should really be part of the buying decision, since service is needed at least on an annual basis. Many stove shops and service technicians offer a service plan that specifies a service schedule, what is covered, travel costs and other details. One way to assess service record is to ask for references. Another is to look for technicians who have taken the national exam to become certified by the non-profit HEARTH Education Foundation. Experienced pellet burners reap rewards for shopping and planning carefully and learning to operate and maintain their pellet heating system. They understand that pellet stoves contribute a dramatic improvement in convenience to the long tradition of the hearth. The fuel itself is easily and cleanly stored and handled in bags. A single loading of a pellet stove can provide long hours of warmth. Pellet stoves also provide a special comfort associated with wood burning. The combination of fans delivering warm air currents and the direct comfort of radiant heat provides special satisfaction on a cold winter day. The heat provided is even and constant, due to the automatically regulated fuel feed responding to owner settings. Pellet stoves also offer strong environmental benefits; pellets not only reduce dependence on finite supplies of fossils fuels like oil and gas, but they also put to good use materials that would otherwise unnecessarily and expensively add to our waste disposal problems. In addition, pellet stoves burn very cleanly and offer the lowest emissions of unwanted pollutants of all solid fuel burning appliances. Burning biomass pellets offers convenient heat delivered with environmental concern.